High energy. Pure joy. There’s simply no other way to describe Don Mancuso’s guitar style. Mancuso’s acclaimed artistry, versatility and professionalism have earned him the respect of his peers plus the accolades of worldwide audiences. The Rochester, NY native began playing guitar at the age of six and began playing in earnest when he was a teen. A keen ear and study of the Rochester music scene allowed Mancuso to hone a unique style and an intense stage presence. By age 18, he was playing professionally with the blues-rock band Black Sheep, featuring vocalist Lou Gramm, who would go on to front the ‘80s supergroup Foreigner. 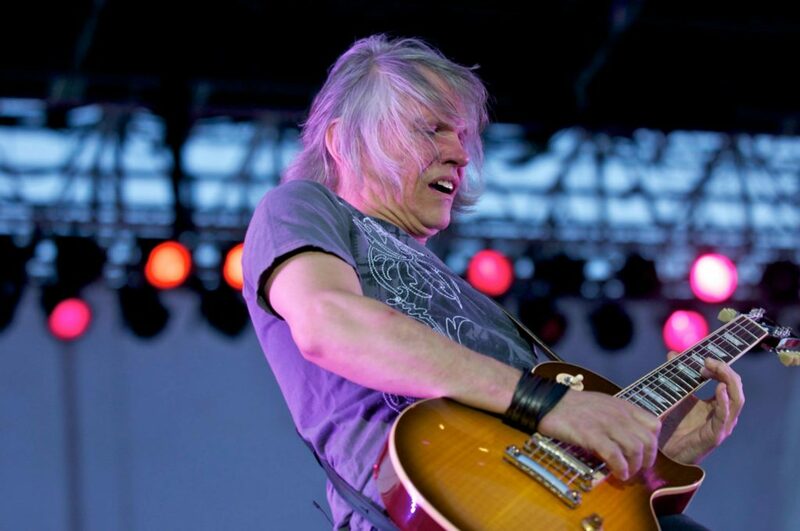 Black Sheep built a solid regional following before touring nationally in support of a host of legendary artists and bands, including Argent, Peter Frampton, Hall & Oats, KISS, Ted Nugent and Procol Harem. Black Sheep released two albums, Black Sheep and Encouraging Words, both of which featured songs penned in part by Mancuso. Presently Mancuso divides his time between service as the guitarist in The Lou Gramm Band and work on his solo endeavors. His first solo album, Now You See It, was followed up by DDrive, which featured the talents of Gramm, Phil Naro, Jeff Cosco, Jessica Hamilton, Dave Quick, Joe Lana, Larry Crozier, Brian Egglestein and fellow Lou Gramm Band member Andy Knoll. While DDrive began as a solo effort, it metamorphosed into a true band effort by the time the follow-up ‘Straight Up The Middle’ made its debut in early 2007. Straight Up the Middle featured the nucleus of Mancuso, Naro and Knoll. Gramm lent his voice to background vocals at Mancuso’s request. Originally a self-published effort, Straight up the Middle, drew the attention of Chavis Records and subsequently was released on the label in July 2007. 2010 DDrive released its 3rd release titled 3D. This was the long awaited follow up to “Straight Up The Middle” (2007), and was released in June 2010 on Melodic Revolution Records. The fans agree it was worth the wait: the album has been well received by both fans and media alike around the world. 3D is an album that will be enjoyed for generations to come. 3D has great significance as well, not only as DDRIVE’s 3rd release but the CD is also housed in a special edition 3D cover with 3D Glasses and features eleven rocking tracks + the album features some special guests like Long time friend Billy Sheehan (Mr. Big, Talas, David Lee Roth) on the first single Dig Down. There is no slowing down for the band as the guys continue to showcase the brand of rock ‘n’ roll live, they have already started writing new material for their next release. “No Strings Attached” is the new solo ep, featuring 6 well crafted instrumental tracks with the help of his friends due out in late August 2011. More info soon!